Ladbrokes has prepared a special incentive for new players to try out their brand new exchange website, giving up to £500 in free bets to new customers. What are you waiting for? 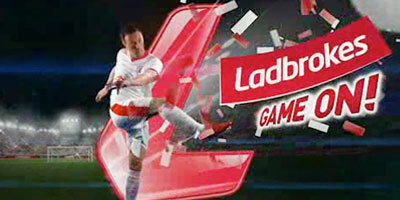 Visit Ladbrokes now and take advantage of this excellent offer! LADBROKES EXCHANGE FREE BET On paying £25 in exchange commission the new member will be given a £25 free bet. For each additional £100 in exchange commission paid, the customer will be given an additional free bet of £25 until a cumulative total of £500 in free bets has been awarded. Free Bet balance can only be withdrawn after it has been wagered once at odds of 1.50 or greater. Free Bet stakes can only be used on the Ladbrokes Exchange, including the mobile exchange app and these must be used within 90 days of being awarded. Offer applies to all Ladbrokes Exchange customers. On paying £25 (or currency equivalent) in exchange commission the new member will be given a £25 free bet. Accounts which have met qualifying conditions will have free bets credited within 72 hours. Free Bets balances cannot be withdrawn until they have been bet with at odds of 1.5 or greater. Free Bet stake is not returned on winning free bets. Free Bets can be used on the Ladbrokes Exchange including the mobile exchange app. Free Bets must be used within 90 days of being awarded. "Ladbrokes Exchange: £500 in FREE BETS for all customers"